CSV files are pretty common but Microsoft Excel sometimes does a lousy job at displaying them properly. With CSVFileView, you can easily view and convert tab-delimited files in an quick and simple way. As with most, if not all Nirsoft programs, CSVFileView is a portable application which does not require installation in order to function properly. Once open, CSVFileView can open and view CSV files. Version 2.41 is a freeware program which does not have restrictions and it's free so it doesn't cost anything. 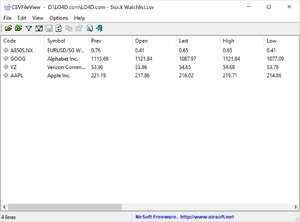 For security reasons, you should also check out the CSVFileView download at LO4D.com which includes virus and malware tests. Additional screenshots of this application download may be available, too. CSVFileView download been highly rated by our users.